Shadowhunters season 3, episode 15, “To the Night Children,” ties up loose ends while ushering in the final arcs of the series. Shadowhunters are tasked with fighting the impossible, the improbable, and the imposing threats that lurk just outside a mundane’s realm of belief. These threats blend into the fabric of what a mundane believes to be their reality, operating in the dark, under the cover of the convincing glamour, existing at once as part of the world, but ultimately separated from society. And that is where they rise to power, in isolation. What happens when the threats become invisible? When they take the form of something you cannot attack with silver blade, or holy water, or an arrow? 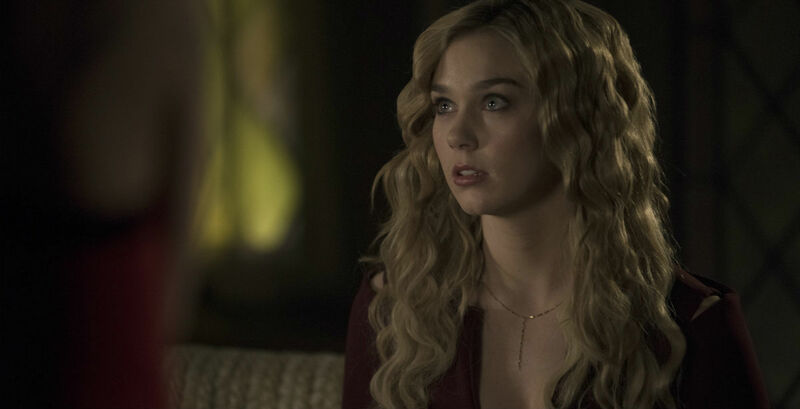 The episodes of 3A utilized physical threats, ones that materialized and we could openly feel unnerved by the sight of — Lilith, Jace under the Owl’s control, the demons who took over the bodies of the other innocent sacrifices. Shadowhunters season 3, episode 15 takes a few physical enemies off of the table, replacing them with something much, much worse – non-tangible threats. This episode, for me, is the turning point of season 3. 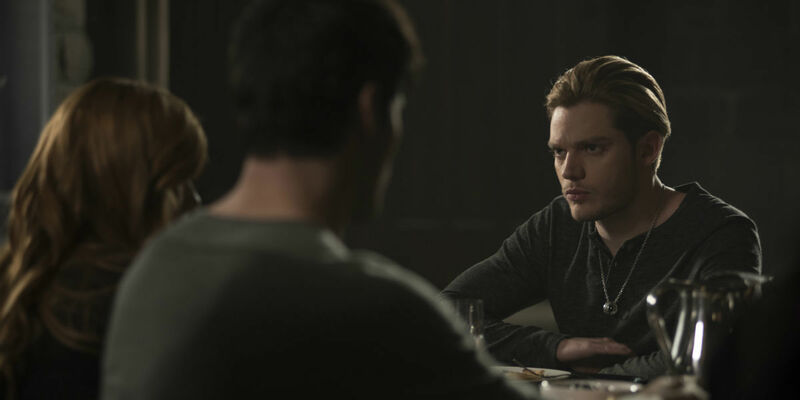 While Jonathan’s presence weighs heavily on the Institute, especially on Clary and Jace, his physical form is mostly absent from the episode. Heidi, although appearing to ramp up her one-woman takeover of the Downworlders, is dusted. And Raphael, far from being a hugely threatening characters, is taken into custody. “To the Night Children” leaves me to think that there are other bigger problems to tackle, more serious issues to unpack as the episode account dwindles with each passing week. The episode takes us into the moments where, when left to their own devices, characters find it harder to stay on course. Using their cloaking runes, Jace and Clary pay Luke a visit in jail. While Clary makes a desperate plea in an attempt to change Luke’s mind about taking the fall for the massacre at the Jade Wolf, it does little to sway him. Luke has been operating apart from everyone for quite some time now and in that self-inflicted isolation he began to piece together a pattern. One where everyone he gets close with winds up hurt. There is no truth that will help ease the suffering he believes the mundanes in his life have taken on. There is no possible path to redemption for leaving his pack. Instead, he would rather take on the burden of his decisions from inside a jail cell. While this is not the way we’d like to see Clary’s one and only father-figure live out his days, the physical prison is nothing compared to one he has constructed for himself in his mind. I’d like to think that Clary would be the one to get him out of this. But perhaps it will take Maia, or Simon, to push him towards realizing that there is not going to be a quick fix to these problems. They will ease with time, but only through time spent with people who are going to remind you who you truly are. Clary needs that reminder now more than ever. It appears that the more time that they spend apart, the stronger Lilith’s rune tries to unite Jonathan and Clary. It’s impossible to say whether Jonathan was lying when he finally saw Clary under the bridge. Did he really feel a pull towards her? But I am leaning on the connection that he made during their fight in last week’s episode that something is drawing her to him. After such an unbalanced start between the two, one where Clary clearly held the upper hand, it’s hard to watch her fall to Jonathan’s power plays. The rune is only a physical reminder of what is happening inside of her. She is distracted, panicked, on edge most of the time. Watching her fight Aline was one such moment. Aline is not a fan of Clary’s and it is a point she makes clear to Jace. How many lives is one girl worth after all? And while Clary did save Counsel Penhallow from Valentine, Aline still makes it a point to bring up her family lineage when they spare at the Institute. She also makes a point to remind Clary that the hunt for Jonathan is only still going on because Clary could not keep him in custody. Aline has a way of getting under your skin, but so does the connection to a person who has demon blood coursing through his veins. Clary loses herself to her rage and begins to attack Aline. Luckily, Jace is able to pull her away, but instead of seeking some kind of help, she retreats to be alone. Jace is a fighter, he wants to take action. How can you get rid of something that you cannot physically attack? It’s a struggle that Jace has had to tackle more often than not in the last season. He cannot rid himself of the visuals of the Owl and now he cannot use his training to eliminate the threat of Jonathan and protect Clary. Clary’s panic following the events in the training room are only compounded when she runs into Jonathan. He does not make an advance or shrink back from her attacks. In fact, it is a very civil meeting, one where Clary appears to lose herself even more. The fighter full of disgust and distrust is still there, but she is fading into uncertainty. She needs the people who believe in her to lift her up, recognize the signs that something is not right. But in her confusion, Clary begins to wander and as she does, she begins to lose connection to physical sensation. There was that great scene where Sebastian burns himself with iron in 3A that parallels the fascination with heat and burning in this episode and the previous ones from 3B. As Clary burns her hand, Jonathan feels the burning and can sense that she is getting closer to him. And as Jace pulls her away from the fire, you can see cause for concern. Healing runes can take away the mark on her palm, but they cannot rid her of everything else that is going on. That, I hate to say, is a job for the Silent Brothers. Tensions between the vampires and the werewolves may begin to settle now that Heidi is gone, the clan leaders are in custody, and the pack’s numbers have dwindled. However, two major issues are left on the table. Maia has to return to lead a damaged pack without Luke there to help guide her. And she has to do so without the trust of the Institute and, perhaps more importantly, without the trust of Simon. For as horrible as she was, Heidi opens the episode with a great speech. Everyone in this room should be proud. Proud to call yourself a vampire. If that makes people afraid, then let them be afraid. We should never, ever be ashamed of who we are. The days of being locked out are over. If they don’t let us in, then we break down the door. Anyone who stands in our way will face the consequences. The down world is ours for the taking, the shadow hunters have had their day in the sun, but our night has come. It’s our time to rule. Though used to rally the clan into violent action, it plays over two characters who are having a tough go at coming to terms with issues outside of the clan. We see Simon physically locked out of the Praetor even though he is trying to help save Jordan. We see Raphael intentionally burning himself with holy war in repentance. They have both been wronged, lost trust, and are bearing the weight of immeasurable responsibility for Heidi and her actions. Raphael has cast himself out of society and into service. Simon finds ways to stay above board on all matters concerning Heidi, launching an investigation into proving her involvement to Alec. And things do not work out. Heidi is one step ahead of Simon at all times. Raphael is not an exception to the rules of the Institute. Maia, much like Jace, is a woman of action. There is a threat, a way to eliminate it, talking be damned. While Simon makes progress keeping his standing with the Institute intact, Maia chooses the path of least resistance. She fights Heidi in an alleyway and kills her with holy water. While she technically did not break any rules and no one was there to speak against her actions, Maia is free, and Heidi is gone. The hurt on Simon’s face rivals the emotional toll we saw at the start of episode 12. Simon is a good kid, with a big heart. He does not want to see his friends suffer and lose themselves to the urges that Heidi did. It’s easy to give up control, but crumbling under the weight of anger, or fear, or doesn’t make someone stronger. It only levels the playing field for more unwise choices to be made. Isabelle counters those choices by facing her biggest mistake – not turning Raphael in for his crimes. Alec broaches the subject with enough force to push Izzy to see that she was in the wrong, but also with enough softness to allow her the opportunity to make things right. Raphael and Isabelle’s parting scenes were a touching testament to not only the better moments of their relationship, but to the complicated world they inhabit. On a MUCH lighter note, Alec was Mr. New York Institute. His confidence shined in a new light as he not only led Magnus through the adjustment of living at the Institute but took control of the situations, he had on hand diplomatically and openly. Mistakes were made and he was not too proud to hear an opposing argument with support. As the rules bend, Alec realizes that he can keep pushing them further and further, but what does that reflect back to the people who trust him? He does not shirk away from the big moments when they matter, pushing back against Magnus’ jealousy, asking Magnus to move into an apartment with him. All huge milestones. 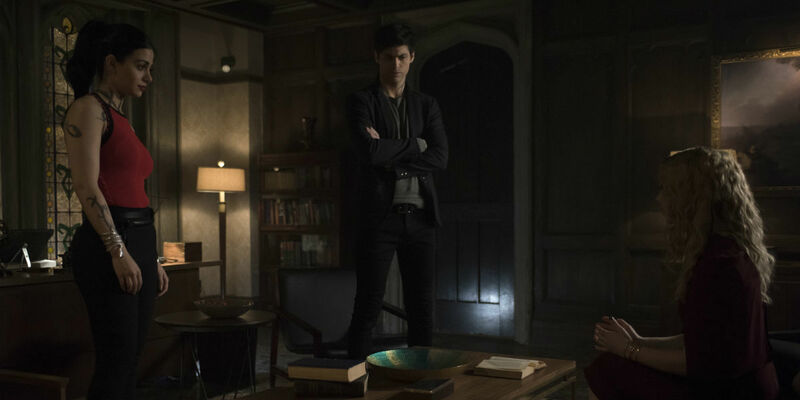 But what Alec can control – operating within the rules of the Institute, the parameters he and Magnus work out in their relationship – does not help him when it comes to Magnus’ magic reacting against his body. Magnus does a bang-up job hiding his reaction to Lorenzo’s magic, but it catches up with him in the final moments of the episode. I sense a difficult decision is headed Magnus’ way – a life with magic and consequences of that, or a life without it. We’ve already seen him tackle this issue and move on quickly to a world where he could have everything he wants. But what will if that is simply not possible? The detective who brought Luke in definitely knows what is going on, right? I’m sure he has other stories he can drum up about Luke’s behavior over the years, but the squirrel one was delightful. Jordan is going to be alright, but will Maia? Let’s hope that the two can reconnect and help each other grow from their experiences. Is this is for Raphael? I hate to see him go. Shadowhunters season 3, episode 15, “Stay With Me,” sirs Monday, April 1 at 8:00 p.m. ET on Freeform.